Follow them in their adventures! We were waiting for Dr. Jacmer Touchon to come to tea. Our offices, I should explain, occupied part of the parlour floor of a magnificent old dwelling which once housed a president of the United States in his retirement. You enter through a hall room which I share with the office boy. Mme. Storey's room is the former drawing room of the President, a long and lofty chamber with a row of casements looking out on the park. Its present aspect is that of the sala in an old Italian castle. I was seated in a corner of this room, somewhat nervously occupying myself with the typewriter, since my employer wished me to be present throughout the doctor's stay. I noticed that Mme. Storey had condescended to dress especially for the tea party. She was wearing one of the clinging robes designed for her by Fortuny. They have no relation to the fashion of the moment, but they suit her long slim figure admirably. Moreover, they are in keeping with the wonderful room. You might say that the whole room was designed as a frame for Madame in a Fortuny gown. These dresses are made of clipped velvet dyed by a special process in blending colours, some flamelike, some opaline. This particular one I remember was in different shades of shimmering green. While Mme. Storey waited for her guest the suspicion of an ironic smile clung about her lips. My mistress is the least vindictive of women but I am certain that she looked forward with pleasure to destroying this scoundrel. 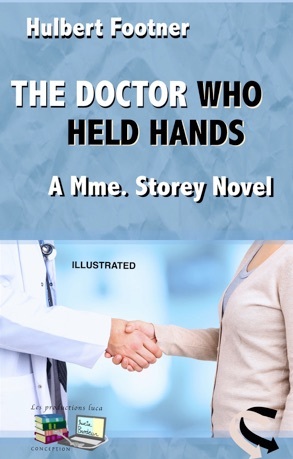 I begged her not to introduce me to the doctor, not to bring me into the party as she always does, but to allow me to go on working quietly in my corner. Otherwise I did not see how I could support the ordeal. In my plain working dress and natural complexion, and with my red head bent over the typewriter, I thought there would be little danger of his recognizing me. When the boy announced him I forced myself to look up, because to have kept my head down at that moment would certainly have looked suspicious, I cannot convey the impression of evil that I received as he entered. I would as lief have seen a cobra erect itself and spread its hood. Yet he was a handsome, smiling gentleman and most beautifully dressed. He wore the formal morning coat, slightly out of fashion now, but displaying to advantage his trim waist and broad shoulders. The sobriety of his dress threw into strong relief his high-coloured sensual face, and full, beaming, insolent dark eyes. The only touch of foppery about him was his sleek hair, which he wore rather long and brushed straight back with just the hint of a wave in it. It was that which made him a little too good-looking. He kissed Mme. Storey's hand with all the grace of an old-world cavalier. Me, he appeared not to see. I tapped the keys at random, while I watched through my lashes and listened. Dangerous he might be, but Mme. Storey was no less so. I have never seen her so alluring. She blandished him like a lovely cat, her eyes shooting sparks sideways. She exulted in the consciousness of her own power. God help the man she set out to fascinate. Only once or twice in my life have I seen her exert herself thus. It was always with the aim of destroying her victim. She used to complain ruefully that she couldn't fascinate anybody she really liked. She led him around, showing him the Italian primitives, the ancient faience, the carved furniture. He looked at her more than at the art objects, and she was well aware of it. I couldn't hear what he said but it didn't matter. He was full of assured talk and laughter. No doubt all the proper things to say about art were at his tongue's tip. However, when she led him back to the front of the room for tea he dropped his guard for a second and I saw his eyes fasten on her back with a look of resentful pain. He was touched. Round one to Mme. Storey, I thought. Yet I was wretchedly anxious, too. At such a moment the wickedness of the man showed nakedly. Of what avail all her cleverness, I asked myself, against the arbitrament of violence? Tea was served on the old black table my mistress uses for a desk. This brought them close to my corner. Fortunately for my peace of mind, Mme. Storey waved Dr. Touchon to a seat where his back was toward me. He was so near I could have reached out and touched him. Up to this time he had not appeared to look at me. "Where is my little friend Nino?" he asked. "In his box in the next room," said Mme. Storey. "Nino is never invited to tea because he steals the lighted cigarettes if they are put down for a moment, and retires to the top of a picture frame to smoke them." "But surely it's worth the loss of a cigarette or two to witness so comical an exhibition of depravity," he said. "Yes," said Mme. Storey drily, "but they always make him sick." Through their lightest talk ran an ominous note. Apparently both delighted in this element of danger but it made me shiver. Dr. Touchon engaged in endless approaches to throw his baleful personality over her like a loop but always she cunningly withdrew, just in time. I could not see his face but I could imagine the play that he was making with his extraordinary eyes. I observed that my employer never quite met them. It was part of her game, of course, to make believe to be a little afraid of him at this stage. There was an obstinate dimple pressed into her cheek. Obviously she was having a first-rate time. "And so you still read my poor little books!" he said. "How far the pupil has outstripped the master!" "Oh, I wouldn't say that," she said. "I'm sure you make ever so much more money than I do." "Oh, I make plenty of money," he admitted coolly, "and through the practise of the most shameless quackery. I wouldn't think of concealing it from an initiate like yourself. We're both in the same boat. We seek pure knowledge for the love of it and practise humbug to make money." It made me indignant to hear him seek to link himself to my employer in that fashion. She merely smiled and let him make what he would of it. "I have followed your cases as well as I could in the newspapers," he went on, "but they are reported so badly very often the essential thing is omitted. However, one begins to grasp your style. Brilliant bravura work. One can see you fooling all these ninnies with your tongue in your cheek. How astute of you to choose a field where all the other performers are so stupid!" Listening to this sort of thing, I got madder and madder. He was trying to make out that Mme. Storey was a faker just like himself! "Ah, I see that nobody can fool you," she murmured with an intoxicating side glance. He hitched his chair a little closer. "I have learned a lot since the days when I wrote those immature books," he said. "You should let me give you a lesson now." "Oh, do!" she said. "I should love it!" He glanced over his shoulder at me. I don't think he saw me really, this was just a hint to Mme. Storey that they could have a better time if I was sent out of the room. She ignored it, of course. "It was inevitable that you and I should come together again," he went on in a low, vibrant voice. "We have climbed to the same height above the generality of mankind. We can look down on their folly with a smile. We have risen above their silly notions of right and wrong. We can look in the face of the sun and dare to be ourselves. We have discovered the great secret — — "
"Which one?" asked Mme. Storey drily; "there are so many!" "The knowledge that a strong will is a law only to itself!" "Yes, it's comfortable, isn't it, to reach the point where your conscience no longer troubles you." He didn't know she was laughing at him but I did.